Enjoy a bright breakfast seated at your kitchen counter or island in the Amish Nine Spindle Windsor Bar Stool. These Amish made chairs offer the beauty of the Windsor design with nine perfectly spaced spindles to support your back comfortably. Amish made in America, these Windsor bar stools represent the popular colonial style, exhibiting an elegance and grace that you'll love. Offering a sturdy, light design, the Nine Spindle Windsor Bar Stool provides an attractive seating option for your kitchen area or game room. Enjoy an active game night with these Amish stools to help you host. Tale a look at our collection of Amish Bar Stools and Counter Chairs to see all the styles we have to offer. The Kitchen: Line your kitchen counter, island or surround your pub table with a set of Amish counter stools that instantly create a casual dining area. Bar stools in the kitchen come in handy during large parties or when unexpected guests arrive. The Bedroom: Place a bar stool in front of your vanity mirror for a comfy seat to use while you get ready for an evening out. The Amish American Saddle Barstool provides a great option for your vanity. The Game Room: Relax comfortably when it's not your turn at the pool table in a stylish solid wood bar stool. 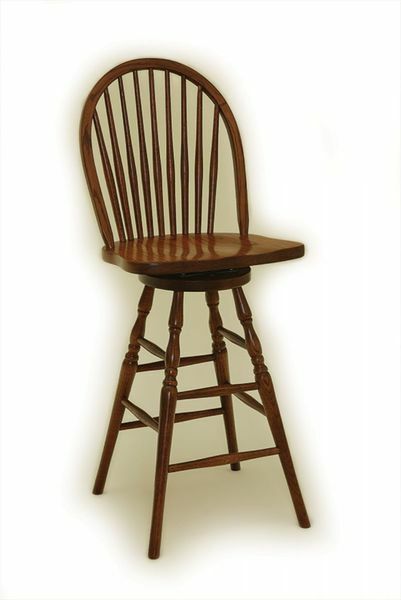 Call us today, at 866-272-6773 to speak with an Amish Furniture Specialist about your Windsor Bar Stools.